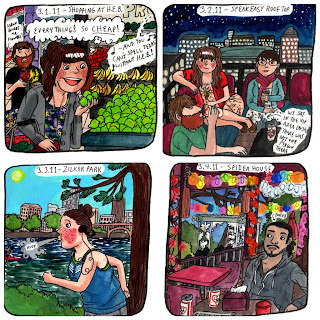 I don't remember how I discovered or how long I've been reading comic artist Melinda Boyce's blog of adorable diary comics but I've been fan of her work for at least a year. Her drawings aren't (usually) meant to be funny as much snapshots of her life and adventures with her friends, family and boyfriend, Aaron (who she also does a collaborative comic with and is one of the main featured players). I loved her cozy portraits of her life in Portland and definitely missed them when they disappeared from my RSS feed for a while. So imagine my surprise when she resurfaced and announce that she had been absent because she had moved to Austin (apparently a city she'd never even visited!) along with Aaron and three other friends! Hey, wait a minute - that's my city! While getting settled in, she is making up for her hiatus with a new series called "Falling in Love with Austin." One of my favorite things about living here is when I get to share the great Austin-y places and things I've discovered and this is such a fresh take on the concept. So far there's only four in the series but I've already fallen in love and definitely look forward to seeing more. Her drawings are so cute and such a good idea. And The Spider House looks interesting. TRUEFAX: Alex & I had our first date at Spider House!